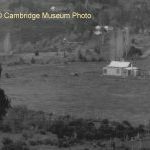 In July 1916 the Cambridge Domain Board informed the Acclimatisation Society that they were prepared to let them have what land they required on Carter’s Flat for a Game Farm, on a lease to suit. It would assist in any way it could including a yearly peppercorn rent of one shilling. Fred Potts built two hatching sheds for £20 each with fireplaces and water laid on. The pheasants arrived at the farm on 5 September 1916. Later that month a ranger Mr Edward McAnally (with British and New Zealand experience of pheasant and partridge breeding) took charge. He was employed at a salary of £3 5s a week and a house allowance of 10 shillings as he lived in town. In October Richard Reynolds supplied wheat at 5 shillings a bushel for feed. C A Whitney donated a scare gun. McAnally reported that the pheasants had started to lay on 6 October. He stated that the site of the hatchery was in every way excellent and that the soil could not be improved upon. In 1917 the Noxious Weed Inspector ordered the farm to be cleared but the Borough Council asked that the broom remain to shelter birds from hawks. In March the golden and silver pheasants were placed in their pens and the public were asked to let them settle in before visiting. The caretaker reported that quite a lot of trouble had been caused by ferrets and that he had killed about 16 recently. A number of prowling cats had also been shot. 400 birds had been liberated. In November the Borough Council leased the adjoining Crown Land at ten shillings for five years and negotiated for Carter’s house and 4 acres for £400. By the end of 1917 McAnally had raised between 1,000 and 1,200 pheasants with 365 ready for release. That was the highest breeding rate of any pheasants reared in NZ. In 1918 eight small pheasant pens were built by Mr Jarrett but the lack of netting, caused by war, increased the vermin problem. There was also a shortage of feed. By December 1918 McAnally had bred 1,108 pheasants and gave 100 to the Tourist Department. He also bred 143 Mallard Ducks of which he released 131 and retained 12 for breeding. At the end of 1918 and beginning 1919 the Flu epidemic hindered deliveries. The farm went backward as McAnally became disgruntled with the conditions of the job. The Council lifted his wage to £5 a week and a free house. Richard Reynolds took over the supervision and Mr Haywood was engaged to assist. Vermin was still bad so new buildings were erected. Reynolds planted crops of sunflower to supplement the bird food and the farm was cleared of weeds etc. In 1920 the cost of raising birds escalated to £2 a brace and the next year 250 pheasants escaped from the farm. In 1922 the government subsidy of £100 was stopped and in spite of improvements the curator only raised 1,000 pheasants. Council was dissatisfied with the result. They found that pheasants raised by Andrew Dobson on a private farm at Tuakau were much better and cheaper. The next year Reynolds stepped down as supervisor and this meant lack of local supervision over McAnally and the game farm. The Game Farm had become uneconomic and the Auckland Acclimatisation Society decided to close it down and move to Pukekohe. The report said – ‘The conditions of the farm are not all that could be desired. The cost of the birds reared is far too high, and the majority of the birds are a very poor lot, some being permanent cripples through cramp’. The coops, pens and appliances were thoroughly cleaned and moved to the new site. The land leases were terminated and the society sold the original four acres to a private buyer for £400 cash.